Sun Cellular is offering its subscribers more options to maximize their load with call and text products that will suit their budget and lifestyle. With Sun Prepaid CTU Call and Text Unlimited Promos, you can choose from range of call and text features of up to 30 days validity. Enjoy unlimited text to all networks, unlimited calls to Sun, Smart & Talk ‘N Text subscribers. Plus, you can have unlimited access to Facebook or free regular load! All in affordable rates. Get the best value for your money and stay in touch to your loved ones any time and anywhere you are. Take control of your load and get limitless connection to your family and friends. 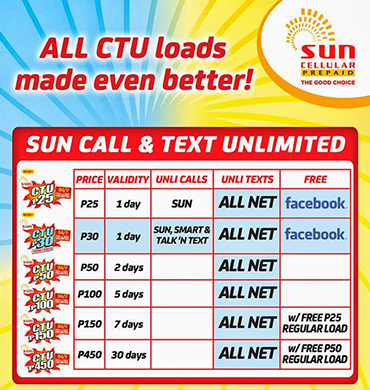 All Sun Prepaid Call and Text Unlimited loads can also avail thru Xload, Call Card and via Conversion syntax only (except for CTU30 – Xload and Conversion). Keep posted on Sun Prepaid CTU Call and Text Unlimited Promos and other Sun Cellular call, text and data promos by visiting us again. You can also check Sun Cellular’s Facebook page for more details about their offers.